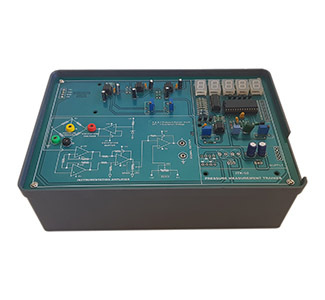 On board 1Khz Sine wave generator for excitation. Primary Excitation voltage of 5V DC on board provided. 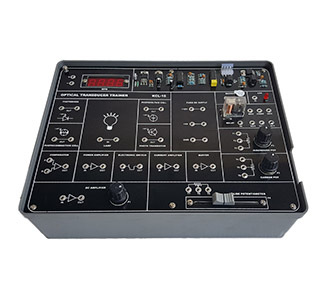 On-board 41/2 Digital Panel Meter provided using AD7135. Pressure generation and Monitor using a Pressure gauge. Resistive cantilever type Load cell is used to measured up to 3 KGs. 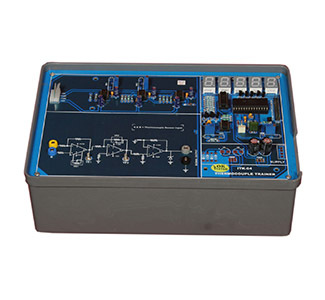 Primary Excitation voltage of 12V DC provided on board. 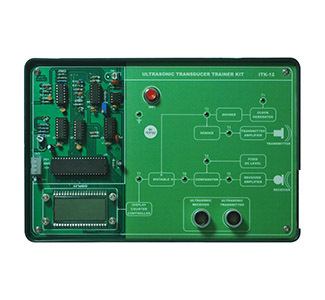 Capacitive Level Transducer to Measure Level up to 100mm. 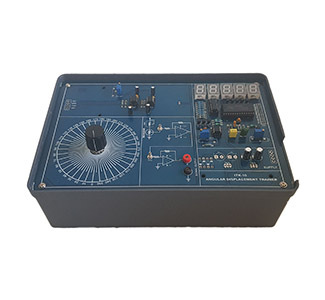 Resistive Transducer using multi turn potentiometer to measure Angle from 0° to 360°. 12V Heater provided on board. Resonant Frequency of the Transducer is 40 KHz. Excitation Source 40 KHz Frequency provided on board. Measurement Range From 25 cm to about 6 meter. 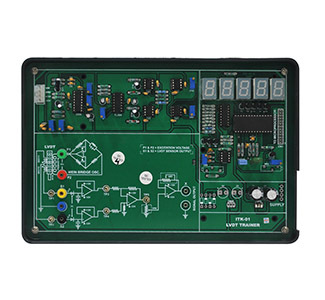 On-board Digital Panel Meter provided Measuring range of +/-1V & Digital RPM Meter. 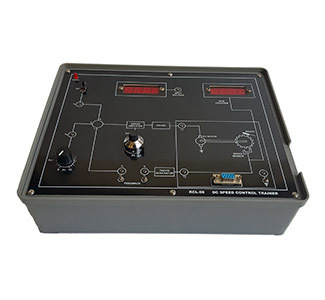 Resistive Load cell is used to measure Load/Strain up to 3 KGs. Simulated blocks like dead time (transportation lag), integrator, time constant, error detector and gain. Built-in signal sources of Square wave and Triangular Frequency of 45-90Hz With Amplitude 0-2.5V. 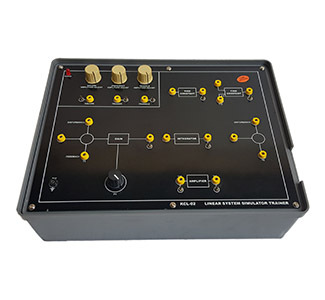 Uncommitted amplifier for phase adjustment, Provision for disturbance inputs. High quality servo-potentiometers of 360 degree shaft rotation. 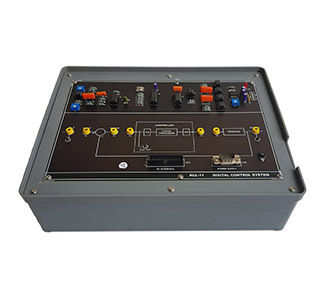 Built-in signal and power sources. 3½ digits DVM for measurements. 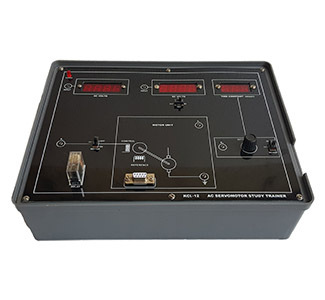 Temperature controller with facilities for P. I, D and relay control blocks. Operating temperature: Ambient to 900C. Separate controls for P, I, D channel gains, Two settings for relay hysteresis. Fast 25W oven fitted with IC temperature sensor. Digital display of set and measured temperature on 3 ½ digit built-in DVM. Study of 4 different temperature transducers - NTC thermistors, RTD Platinum, K(Cr-Al) thermocouples, IC temperature sensors. 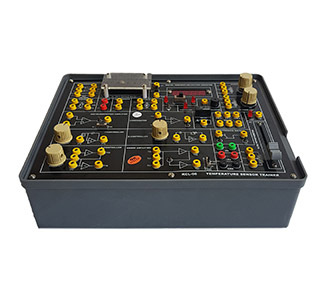 Simulated electronic relay using high speed IC’s. Simulated 2nd order linear plant. Facility for displaying x and x’ signaling. 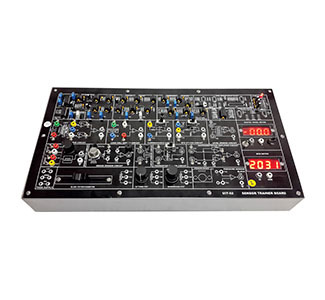 Built-in Signal source- Sine and Square Amplitude: 0-1V (min) with Variable Frequency: 10 to 1000Hz. Speed range: 0 to 3000 rpm (typical), Opto-interrupter based speed sensing. 4-digit speed display in rpm, Electronic tachogenerator for feedback. 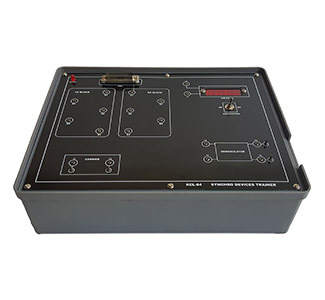 Separate unit for motor in a see-through cabinet, Smooth, non-contact eddy current brake for loading. Built-in 3 ½ digit DVM for signal measurements. 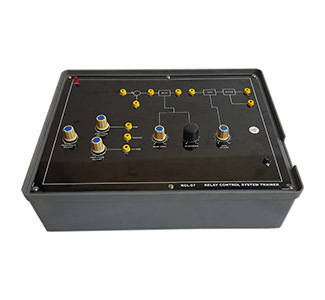 Compensation network implementation through built-in variable gain amplifier. Gain is adjustable from 1 to 11. 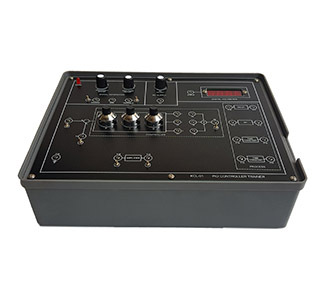 Built-in square and sine wave generators for transient and frequency response studies. Frequency adjustable from 25Hz – 800Hz (approx). 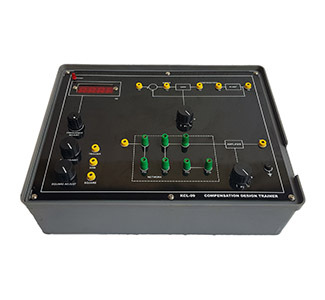 Single stepping and free running modes of operating with speed variation and direction reversal – internal TTL circuit. 360O motion Servo-Potentiometer position-pickup for motor dynamics. 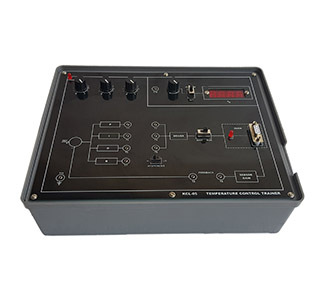 Operation through microprocessor kit-sample control programs provided. 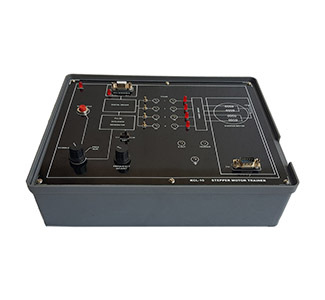 Stepper motor enclosed in see through metal cabinet, Torque 3 Kg-cm, Step angle 1.8 O, Power 12V, 1A/ phase. 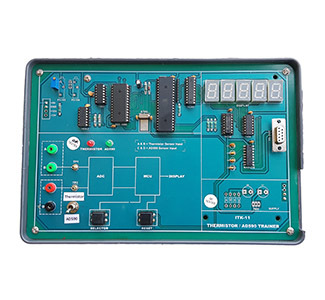 8085 based µP-kit as digital controller with user software in 8K EPROM. 16-bit arithmetic for algorithm calculations. Square wave test input (internal). 16 built-in levels of p. I and D gain each. 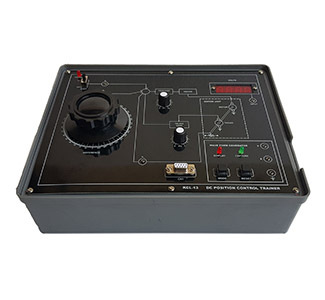 2-phase a.c. servomotor – 12V/50Hz per phase enclosed in see through metal cabinet. 4-digit speed display, 3-digit time constant display. 3 ½ digit r.m.s. voltmeter, 3 ½ digit d.c. panel meter. Provision for positive and negative tachogenerator feedback. Tacho constant: 2V/ 1000 rpm approximately. µP based waveform capture card. 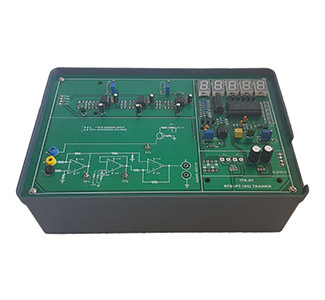 Built-in step signal and IC regulated power supplies for electronic circuit. Servo-potentiometer with full 360 degree rotation. Separate unit for motor in a see-through cabinet. 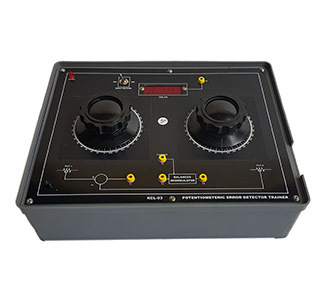 2-phase servomotor 12V/ phase, 50Hz, 10W with calibrated dials coupled with Potentiometer enclosed in see through metal cabinet. Servo potentiometer type error detector. 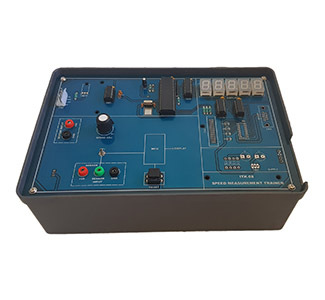 In-built 10.00V (rms) panel meter. On board Rotary, Slide Potentiometers, Relay & LED circuits provided. With tachogenerator enclosed in see through metal cabinet. Speed range: 0 to 2000 rpm (typical), Opto-interrupter based speed sensing. 4-digit speed display in rpm., Electronic tachogenerator for feedback. Separate unit for motor with 2Kg Spring Balance provided for loading. Built-in 3 ½ digit DVM for signal measurements, 3 ½ digit Current Meter.